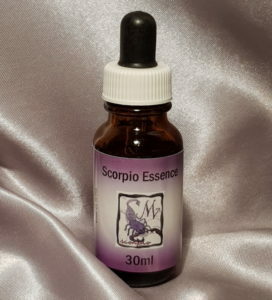 Scorpio Essence is the eighth in our Star Sign Range. Also the eighth sign of the zodiac Scorpio the Scorpion (24th October – 22nd November) has its basis in the Scorpion’s tail symbolising the sting and intensity of the sign. Scorpio is the sign of passion, vibrant feelings and instinct. Scorpios are idealistic, extremist and sometimes uncontrollable, possessive and destructive. They often have psychic powers. The personality has issues relating to the use, abuse and misuse of power. The karmic challenge for Scorpio is to uncover the treasure hidden in the traumatic events of the pasts. The fact of Scorpio’s survival is part of that treasure, as is the strength if personality that has developed as a result of challenge.